Bharat Book Bureau Provides the Trending Market Research Report on “GCC Fruit Juice Market: Industry Trends, Share, Size, Growth, Opportunity and Forecast 2018-2023”under Food & Beverage category. The report offers a collection of superior market research, market analysis, competitive intelligence and Market reports. 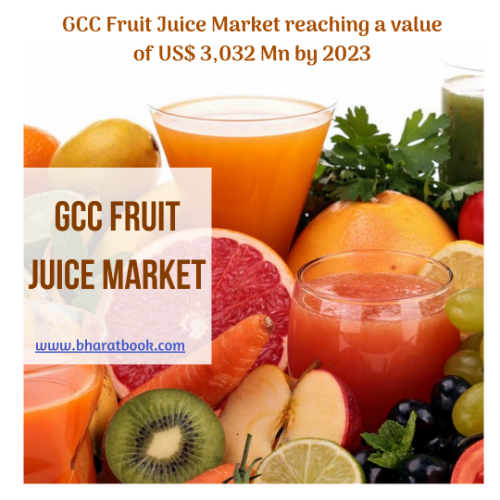 The GCC Fruit Juice Market reached a value of US$ 2,150 Million in 2017. The demand for fruit juice in the GCC region has been strong on the back of a shift in consumer preference towards non-carbonated and natural fruit beverages, rising prevalence of obesity and other lifestyle diseases, expanding multicultural young population, changing lifestyles, strong urbanisation rates, and increasing income levels. Rising demand for healthier beverage options in the region has driven manufacturers to develop products that are more natural and offer higher nutritional content. Looking forward, GCC Fruit Juice Market to grow at a CAGR of 5.9% during 2017-2023, reaching a value of US$ 3,032 Million by 2023. Catalysed by its oil and gas sector, the GCC region has witnessed strong economic growth over the last few decades. Moreover, with over 75% of the population living in urban areas, the GCC is one of the most urbanised regions of the world. As a result of changing lifestyles, consumers are opting for ready-to-drink beverages such as fruit juices thanks to their easy availability, anytime-anywhere consumption, and convenience. The prevalence of overweight and obesity is fairly high in the GCC countries and consumers are increasingly becoming concerned regarding their health. This is creating a shift of consumer preferences from carbonated and artificial beverages towards natural and healthier alternatives such as 100% fruit juices. The GCC region has a large and culturally diverse population with around half of the population being less than 25 years of age. Population growth rates in the region is also significantly higher compared to most of the other parts of the world. With the young and working population representing a key consumer base for fruit juices, we expect demand to remain high in the coming years. On the basis of product, the market has been segmented as juice drinks, 100% fruit juice, concentrates, nectars, powdered juice and others. Juice drinks dominate the market, holding the largest share. Based on the flavour, orange accounts for the majority of the total market share. Other major flavours include mango, mix fruit, apple and others. Based on the type of packaging, the market has been segregated into tetrapack, bottles, cans and others. Amongst these, tetrapack accounts for the majority of the market share. On the basis of distribution, the market has been segmented into supermarkets and hypermarkets, convenience stores, specialty stores, online and others. Country-wise, the market has been segmented into Saudi Arabia, UAE, Kuwait, Oman, Qatar and Bahrain. Amongst these, Saudi Arabia is the biggest market, accounting for the majority of the total market. This report provides a deep insight into the GCC fruit juice market covering all its essential aspects. This ranges from macro overview of the market to micro details of the industry performance, recent trends, key market drivers and challenges, SWOT analysis, Porter’s five forces analysis, value chain analysis, etc. This report is a must-read for entrepreneurs, investors, researchers, consultants, business strategists, and all those who have any kind of stake or are planning to foray into the GCC fruit juice market in any manner.